The economy of Armenia grew by 7.5% in 2017 and reached a nominal GDP of $11.537 billion per annum, while per capita GDP grew by 10.1% and reached $3,880 (from $3,525 in 2016). Until independence, Armenia's economy was based largely on industry—chemicals, electronic products, machinery, processed food, synthetic rubber and textiles; it was highly dependent on outside resources. Armenian mines produce copper, zinc, gold and lead. The vast majority of energy is produced with imported fuel, including gas and nuclear fuel from Russia (for its one nuclear power plant.) The main domestic energy source is hydroelectric. Small amounts of coal, gas and petroleum have not yet been developed. Armenia's severe trade imbalance has been offset somewhat by international aid, remittances from Armenians working abroad, and foreign direct investment. Economic ties with Russia remain close, especially in the energy sector. The former government has made some improvements in tax and customs administration in recent years, but anti-corruption measures have been more difficult to implement in the period when Republican Party of Armenia was in power. This is expected to change after 2018 velvet revolution. Under the old Soviet central planning system, Armenia had developed a modern industrial sector, supplying machine tools, textiles, and other manufactured goods to sister republics in exchange for raw materials and energy. Since the implosion of the USSR in December 1991, Armenia has switched to small-scale agriculture away from the large agroindustrial complexes of the Soviet era. The agricultural sector has long-term needs for more investment and updated technology. The privatization of industry has been at a slower pace, but has been given renewed emphasis by the current administration. Armenia is a food importer, and its mineral deposits (gold and bauxite) are small. The ongoing conflict with Azerbaijan over the ethnic Armenian-dominated region of Nagorno-Karabakh (which was part of Soviet Azerbaijan) and the breakup of the centrally directed economic system of the former Soviet Union contributed to a severe economic decline in the early 1990s. Armenia ranks 29th out of 162 economies according to the 2018 Report (with data for 2016) of Economic Freedom of the World published by Fraser Institute. Armenia ranks 44th out of 180 economies according to the 2018 Index of Economic Freedom published by Heritage Foundation. Armenia is ranked 20th freest among the 44 countries in the Europe region. Armenia ranks 47th out of 185 economies according to the 2018 ease of doing business index. Armenia ranks 70th out of 140 economies according to the 2018 Global Competitiveness Index. At the beginning of the 20th century, the territory of present-day Armenia was a backward agricultural region with some copper mining and cognac production. From 1914 through 1921, Caucasian Armenia suffered from war, revolution, the influx of refugees from Turkish Armenia, disease, hunger and economic misery. About 200,000 people died in 1919 alone. At that point, only American relief efforts saved Armenia from total collapse. The first Soviet Armenian government regulated economic activity stringently, nationalising all economic enterprises, requisitioning grain from peasants, and suppressing most private market activity. This first experiment of state control ended with the advent of Soviet leader Vladimir Lenin's New Economic Policy (NEP) of 1921–27. This policy continued state control of the large enterprises and banks, but peasants could market much of their grain, and small businesses could function. In Armenia, the NEP years brought partial recovery from the economic disaster of the post-World War I period. By 1926 agricultural production in Armenia had reached nearly three-quarters of its prewar level. By the end of the 1920s, Stalin's regime had revoked the NEP and reestablished the state monopoly on all economic activity. Once this occurred, the main goal of the Soviet economic policy in Armenia was to turn a predominantly agrarian and rural republic into an industrial and urban one. Among other restrictions, peasants now were forced to sell nearly all of their output to state procurement agencies rather than at the market. From the 1930s through the 1960s, an industrial infrastructure has been constructed. Besides hydroelectric plants and canals, roads were built and gas pipelines were laid to bring fuel and food from Azerbaijan and Russia. The Stalinist command economy, in which market forces were suppressed and all orders for production and distribution came from the state authorities, survived in all its essential features until the fall of the Soviet regime in 1991. In the early stages of the communist economic revolution, Armenia underwent a fundamental transformation into a "proletarian" society. Between 1929 and 1939, the percentage of Armenia's work force categorised as industrial workers grew from 13% to 31%. By 1935 industry supplied 62% of Armenia's economic production. Highly integrated and sheltered within artificial barter economy of the Soviet system from the 1930s until the end of the communist era, the Armenian economy showed few signs of self-sufficiency at any time during that period. In 1988 Armenia produced only 0.9% of the net material product of the Soviet Union (1.2% of industry, 0.7% of agriculture). The republic retained 1.4% of total state budget revenue, delivered 63.7% of its NMP to other republics, and exported only 1.4% of what it produced to markets outside the Soviet Union. Agriculture accounted for only 20% of net material product and 10% of employment before the breakup of the Soviet Union in 1991. Armenia's industry was especially dependent on the Soviet military-industrial complex. About 40% of all enterprises in the republic were devoted to defense, and some factories lost 60% to 80% of their business in the last years of the Soviet Union, when massive cuts were made in the national defense expenditures. As the republic's economy faced the prospects of competing in world markets in the mid 1990s, the great liabilities of Armenia's industry were its outdated equipment and infrastructure and the pollution emitted by many of the country's heavy industrial plants. In 1991, Armenia's last year as a Soviet republic, national income fell 12% from the previous year, while per capita gross national product was 4,920 rubles, only 68% of the Soviet average. In large part due to the earthquake of 1988, the Azerbaijani blockade that began in 1989 and the collapse of the international trading system of the Soviet Union, the Armenian economy of the early 1990s remained far below its 1980 production levels. In the first years of independence (1992–93), inflation was extremely high, productivity and national income dropped dramatically, and the national budget ran large deficits. Armenia introduced elements of the free market and privatisation into their economic system in the late 1980s, when Mikhail Gorbachov began advocating economic reform. Cooperatives were set up in the service sector, particularly in restaurants, although substantial resistance came from the Communist Party of Armenia (CPA) and other groups that had enjoyed privileged position in the old economy. In the late 1980s, much of Armenia's economy already was opening either semi-officially or illegally, with widespread corruption and bribery. The so-called mafia, made up of interconnected groups of powerful officials and their relatives and friends, sabotaged the efforts of reformers to create a lawful market system. When the December 1988 earthquake brought millions of dollars of foreign aid to the devastated regions of Armenia, much of the money went to corrupt and criminal elements. Beginning in 1991, the democratically elected government pushed vigorously for privatisation and market relations, although its efforts were frustrated by the old ways of doing business in Armenia, the Azerbaijani blockade, and the costs of the Nagorno-Karabakh War. In 1992, the Law on the Programme of Privatisation and Decentralisation of Incompletely Constructed Facilities established a state privatisation committee, with members from all political parties. In middle 1993, the committee announced a two-year privatisation programme, whose first stage would be privatisation of 30% of state enterprises, mostly services and light industries. The remaining 70%, including many bankrupt, nonfunctional enterprises, were to be privatised in a later stage with a minimum of government restriction, to encourage private initiative. For all enterprises, the workers would receive 20% of their firm's property free of charge; 30% would be distributed to all citizens by means of vouchers; and the remaining 50% was to be distributed by the government, with preference given to members of the labour organisations. A major problem of this system, however, was the lack of supporting legislation covering foreign investment protection, bankruptcy, monopoly policy, and consumer protection. In the first post-communist years, efforts to interest foreign investors in joint enterprises were only moderately successful because of the blockade and the energy shortage. Only in late 1993 was a department of foreign investment established in the Ministry of Economy, to spread information about Armenia's investment opportunities and improve the legal infrastructure for investment activity. A specific goal of this agency was creating a market for scientific and technical intellectual property. A few Armenians living abroad made large-scale investments. Besides a toy factory and construction projects, diaspora Armenians built a cold storage plant (which in its first years had little produce to store) and established the American University of Armenia in Yerevan to teach the techniques necessary to run a market economy. Armenia was admitted to the International Monetary Fund in May 1992 and to the World Bank in September. A year later, the government complained that those organisations were holding back financial assistance and announced its intention to move toward fuller price liberalisation, and the removal of all tariffs, quotas, and restrictions of foreign trade. Although privatisation had slowed because of catastrophic collapse of the economy, Prime Minister Hrant Bagratyan informed the United States officials in the fall of 1993 that plans had been made to embark on a renewed privatisation programme by the end of the year. Like other former states, Armenia's economy suffers from the legacy of a centrally planned economy and the breakdown of former Soviet trading patterns. Soviet investment in and support of Armenian industry has virtually disappeared, so that few major enterprises are still able to function. In addition, the effects of the 1988 earthquake, which killed more than 25,000 people and made 500,000 homeless, are still being felt. Although a cease-fire has held since 1994, the conflict with Azerbaijan over Nagorno-Karabakh has not been resolved. The consequent blockade along both the Azerbaijani and Turkish borders has devastated the economy, because of Armenia's dependence on outside supplies of energy and most raw materials. Land routes through Azerbaijan and Turkey are closed; routes through Georgia and Iran are adequate and reliable. In 1992-93, the GDP had fallen nearly 60% from its 1989 level. The national currency, the dram, suffered hyperinflation for the first few years after its introduction in 1993. Armenia has registered strong economic growth since 1995 and inflation has been negligible for the past several years. New sectors, such as precious stone processing and jewelry making and communication technology (primarily Armentel, which is left from the USSR era and is owned by external investors). This steady economic progress has earned Armenia increasing support from international institutions. The International Monetary Fund (IMF), World Bank, EBRD, as well as other international financial institutions (IFIs) and foreign countries are extending considerable grants and loans. Total loans extended to Armenia since 1993 exceed $800 million. These loans are targeted at reducing the budget deficit, stabilizing the local currency; developing private businesses; energy; the agriculture, food processing, transportation, and health and education sectors; and ongoing rehabilitation work in the earthquake zone. By 1994, however, the Armenian government had launched an ambitious IMF-sponsored economic liberalization program that resulted in positive growth rates in 1995-2005. Armenia joined the World Trade Organization (WTO) in January 2003. Armenia also has managed to slash inflation, stabilize its currency, and privatize most small- and medium-sized enterprises. Armenia's unemployment rate, however, remains high, despite strong economic growth. The chronic energy shortages Armenia suffered in the early and mid-1990s have been offset by the energy supplied by one of its nuclear power plants at Metsamor. Armenia is now a net energy exporter, although it does not have sufficient generating capacity to replace Metsamor, which is under international pressure to close. The electricity distribution system was privatized in 2002. The economy of Armenia grew by 7.5% in 2017 and reached a nominal GDP of $11.5 billion per annum, while per capita figure grew by 10.1% and reached $3880. With 5.5% annual GDP growth rate in June 2017 Armenia was 4th best economy in Europe. With 8.3% Armenia recorded highest degree of GDP growth among Eurasian Economic Union countries in 2018 January–June against the same period of 2017. In 2019 GDP per capita is expected to reach $4604. Armenian GDP PPP (measured in current international dollar) grew total of 316% per capita in the years 2000-2017 becoming 6th best worldwide in these terms. GDP per capita of Armenia, Azerbaijan and Georgia in years 1990-2016, World Bank data. In 2017 mining industry output with grew by 14.2% to 172 billion AMD at current prices and run at 3.1% of Armenia's GDP. In 2017 mineral product (without precious metals and stones) exports grew by 46.9% and run at US$692 million, which comprised 30.1% of all exports. In 2017 construction output increased by 2.2% reaching 416 billion AMD. Armenia experienced a construction boom during the latter part of the 2000s. According to the National Statistical Service, Armenia's booming construction sector generated about 20 percent of Armenia's GDP during the first eight months of 2007. According to a World Bank official, 30 percent of Armenia's economy in 2009 came from the construction sector. However, during the January to September 2010 period, the sector experienced a 5.2 percent year-on-year decrease, which according to the Civilitas Foundation is an indication of the unsustainability of a sector based on an elite market, with few products for the median or low budgets. This decrease comes despite the fact that an important component of the government stimulus package was to support the completion of ongoing construction projects. In 2017 electricity generation increased by 6.1% reaching 7.8 billion KWh. In 2017 industrial output increased by 12.6% annually reaching 1661 billion AMD. Industrial output was relatively positive throughout 2010, with year-on-year average growth of 10.9 percent in the period January to September 2010, due largely to the mining sector where higher global demand for commodities led to higher prices. According to the National Statistical Service, during the January–August 2007 period, Armenia's industrial sector was the single largest contributor to the country's GDP, but remained largely stagnant with industrial output increasing only by 1.7 percent per year. In 2005, Armenia's industrial output (including electricity) made up about 30 percent of GDP. In 2010, retail trade turnover was largely unaltered compared to 2009. The existing monopolies throughout the retail sector have made the sector non-responsive to the crisis and resulted in near zero growth. The aftermath of the crisis has started to shift the structure in the retail sector in favor of food products. In the 2000s, along with the construction sector, the services sector was the driving force behind Armenia's recent high economic growth rate. Industry report on banking sector prepared by AmRating presents slightly varying figures for some of above data. According to private tour operators and other individuals familiar with the country's tourism industry, government claims that hundreds of thousands of foreign tourists visit Armenia each year are inflated. Official statistics show that as many 575,000 tourists visited Armenia from abroad in 2009; the government stated earlier in 2010 that the figure will surpass 620,000 in 2010. However, data from the National Statistical Service shows that there were only 65,000 foreigners staying in Armenian hotels in 2009. Ara Vartanian, the chairman of the Armenian Trade and Industry Chamber, thinks that this measure is a far more objective indicator of the tourist influx into the country. In 2012, as many as 843,330 tourists visited Armenia. As of 2010, the agricultural production comprises on average 25 percent of Armenia's GDP. In 2006, the agricultural sector accounted for about 20 percent of Armenia's GDP. Armenia's agricultural output dropped by 17.9 percent in the period of January–September 2010. This was owing to bad weather, a lack of a government stimulus package, and the continuing effects of decreased agricultural subsidies by the Armenian government (per WTO requirements). According to the head of the Armenian Central Bank's (CBA) department for financial system policies and analyses (Vahe Vardanyan) Armenian banks have no large asset concentrations in foreign markets, particularly in capital markets. They nearly have no purchased securities (so-called securitized packages). For this reason, Armenia was virtually unaffected by the Liquidity crisis of September 2008. Armenian banking assets are very low and made up only 25 percent of the gross domestic product (GDP) in 2008. Armenia's national debt has increased significantly since 2008 when public external debt consisted of only 13.5 percent of GDP. By the end of 2010, Armenia's external debt is projected to form about 42 percent of GDP, and 50 percent in 2012. As of late November 2009, the Armenian government's foreign debt was around US$3 billion, having doubled in size over the course of the previous year. With the Armenian government needing more anti-crisis loans from the World Bank and other foreign donors, the debt-to-GDP ratio is expected to exceed 40 percent in 2010. According to a World Bank official, a country that has around 12 percent rate of growth or even lower, at the range of 7 to 8 percent, can afford a level of public debt of up to 50 percent. The official warned that the debt servicing payments of the Armenian government will surge by 2013 and absorb "quite significant part of tax revenues." According to another estimate, the ratio between the country's gross domestic product (GDP) and the state's foreign debt has reached 46 percent. Economists generally agree that a country is insolvent, if its foreign debt surpasses 50 percent of its GDP. Critics of the government say that the $500 million credit from Russia should have gone to develop industry, instead of going to the construction sector. National Statistics Office publishes official reference exchange rates for each year. In 2010, the value of the Armenian Dram (AMD) was artificially kept high during the height of the global economic crisis. Had the AMD been allowed to depreciate to its market level, exports would have become more competitive and the purchasing power of the majority of the population who are dependent on remittances from abroad would have increased. Instead, the value of the AMD was kept high, out of a fear of inflation and concern about alienating the powerful government-connected importers of oil, sugar, flour, cigarettes and beverages. Cash remittances sent back home from Armenians working abroad—mostly in Russia and the United States—are growing and contribute significantly to Armenia's Gross Domestic Product (between 15 and 30 percent). They help Armenia sustain double-digit economic growth and finance its massive trade deficit. According to the Central Bank of Armenia, during the first half of 2008, cash remittances sent back to Armenia by Armenians working abroad rose by 57.5 percent and totaled US$668.6 million, equivalent to 15 percent of the country's first-half Gross Domestic Product. However, the latter figures only represent cash remittances processed through Armenian commercial banks. According to RFE/RL, comparable sums are believed to be transferred through non-bank systems, implying that cash remittances make up approximately 30 percent of Armenia's GDP in the first half of 2008. In 2007, cash remittances through bank transfers rose by 37 percent to a record-high level of US$1.32 billion. According to the Central Bank of Armenia, in 2005, cash remittances from Armenians working abroad reached a record-high level of $1 billion, which is worth more than one fifth of the country's 2005 Gross Domestic Product. Net private transfers decreased in 2009, but saw a continuous increase during the first six months of 2010. Since private transfers from the Diaspora tend to be mostly injected into consumption of imports and not in high value-added sectors, the transfers have not resulted in sizeable increases in productivity. In March 2018 Moody's Investors Service has changed the outlook on Armenia's rating to positive from stable and affirmed the B1 long-term issuer and senior unsecured debt ratings. According to the National Statistical Service, Armenia's government debt stood at AMD 3.1 trillion (about $6,4 billion, including $5,1 billion of external debt) as of November 30, 2017. Armenia's debt-to-GDP ratio will drop by 1% in 2018 according to finance minister. In Armenia's external debt ($5.5 billion as of January 1, 2018), the arrears for multi-country credit programs dominate - 66.2% or $3.6 billion, followed by debt on bilateral loan programs - 17.5% or $958.9 million and investments of non-residents in Armenian Eurobonds - 15,4% or $844.9 million. The Armenian government collected 383.5 billion drams ($1.26 billion) in various taxes in the first nine months of 2008 (a 33.2 percent increase from the same period last year). Many large companies have a privileged status when it comes to taxation. Big business is not taxed in proportion to its capacity and output, and the disproportionate burden falls on small and medium size businesses. Over half of the tax revenues in the January–August 2008 time period were generated from value-added taxes (VAT) of 20%. By comparison, corporate profit tax generated less than 16 percent of the revenues. This suggests that tax collection in Armenia is improving at the expense of ordinary citizens, rather than wealthy citizens (who have been the main beneficiaries of Armenia's double-digit economic growth in recent years). Many Armenian companies, especially those owned by government-connected tycoons, have long reported suspiciously low earnings, thereby avoiding paying larger taxes. Armenia exported US$2.24 billion worth of goods in 2017, up 25.2% from 2016. Exports grew in all reported groups except for non-livestock food products, oils and fats, paper, vehicles and works of art. In the same period external trade turnover increased by 26.9% reaching US$6.43 billion. In 2010, Armenia's exports remained resource-dependent, largely because the non-resource-intensive sectors were significantly less competitive. Armenia has not succeeded in increasing and diversifying exports beyond raw materials thus leaving room for a greater vulnerability to external shocks. There was a 43.9 percent increase in overall exports during the January to September period. The main three export destinations were Bulgaria with 15.2 percent of total exports, followed by Germany with 14.2 percent and Russia with 13.9 percent. Raw minerals were the main export sent to Bulgaria and Germany. Imports in 2017 amounted to $4.183 billion, up 27.8% from 2016. The global economic crisis has had less impact on imports because the sector is more diversified than exports. In the first nine months of 2010, imports grew about 19 percent, just about equal to the decline of the same sector in 2009. According to the National Statistical Service foreign trade deficit amounted to US$1.94 billion in 2017. In 2017 EU countries accounted for 24.3 percent of Armenia's foreign trade. Whereby exports to EU countries grew by 32,2% to $633 million. In 2010, EU countries accounted for 32.1 percent of Armenia's foreign trade. Germany is Armenia's largest trading partner among EU member states, accounting for 7.2 percent of trade; this is due largely to mining exports. Armenian exports to EU countries have skyrocketed by 65.9 percent, making up more than half of all 2010 January to September exports. Imports from EU countries increased by 17.1 percent, constituting 22.5 percent of all imports. During January–February 2007, Armenia's trade with the European Union totaled $200 million. During the first 11 months of 2006, the European Union remained Armenia's largest trading partner, accounting for 34.4 percent of its $2.85 billion commercial exchange during the 11-month period. In 2017 CIS countries accounted for 30 percent of Armenia's foreign trade. Exports to CIS countries rose by 40,3% to $579,5 million. Bilateral trade with Russia stood at more than $700 million for the first nine months of 2010 – on track to rebound to $1 billion mark first reached in 2008 prior to the global economic crisis. During January–February 2007, Armenia's trade with Russia and other former Soviet republics was $205.6 million (double the amount from the same period the previous year), making them the country's number one trading partner. During the first 11 months of 2006, the volume of Armenia's trade with Russia was $376.8 million or 13.2 percent of the total commercial exchange. In 2017 trade with China grew by 33.3 percent. As of early 2011, trade with China is dominated by imports of Chinese goods and accounts for about 10 percent of Armenia's foreign trade. The volume of Chinese-Armenian trade soared by 55 percent to $390 million in January–November 2010. Armenian exports to China, though still modest in absolute terms, nearly doubled in that period. In 2010, the volume of bilateral trade with Iran was $200 million - which is approximately equal to the trade between Armenia and Turkey. The number of Iranian tourists has risen in recent years, with an estimated 80,000 Iranian tourists in 2010. From January–September 2010, bilateral trade with the United States measured approximately $150 million, on track for about a 30 percent increase over 2009. An increase in Armenia's exports to the US in 2009 and 2010 has been due to shipments of aluminum foil. During the first 11 months of 2006, U.S.-Armenian trade totaled $152.6 million. The volume of Georgian-Armenian trade remains modest in both relative and absolute terms. According to official Armenian statistics, it rose by 11 percent to $91.6 million in January–November 2010. The figure was equivalent to just over 2 percent of Armenia's overall foreign trade. In 2010, the volume of bilateral trade with Turkey was about $200 million, with trade taking place across Georgian territory. This figure is not expected to increase significantly so long as the land border between the Armenia and Turkey remains closed. Despite robust economic growth foreign direct investment (FDI) in Armenia fell by 27% in 2017. According to the National Statistical Service, FDI inflows totaled nearly $246 million in 2017, down from $338 million in 2016. They stood at $178.5 million in 2015. Total net FDI in real sector economy in the first 9 months of 2018 amounted to 59.8 billion drams, up from 57 billion drams in the first 9 months of 2017. Jersey was the main source of FDI in 2017. Moreover, combined net FDI from all other sources was negative, indicating capital outflow. The tax haven Jersey is home to an Anglo-American company, Lydian International, which is currently building a controversial massive gold mine in the southeastern Vayots Dzor province. Lydian has pledged to invest a total of $370 million in the Amulsar gold deposit. Negative values indicate investments of Armenian corporations to foreign country exceeding investments from that country in Armenia. FDI stock to GDP ratio grew continuously during 2014-2016 and reached 44.1% in 2016, surpassing average figures for CIS countries, transition economies and the world. By the end of 2017 stock net FDI (for the period 1988-2017) reached 1824 billion AMD, while gross flow of FDI for the same period reached 3869 billion AMD. During the sector consolidation process in 2014-2017 the share of foreign capital in the authorized capital of the Armenian commercial banks decreased from 74,6% to 61,8%. Net FDI in founding capital of financial institutions accumulated by end of September 2017 is presented in pie chart below. The Armenian government receives foreign aid from the government of the United States through the United States Agency for International Development and the Millennium Challenge Corporation. On March 27, 2006, the Millennium Challenge Corporation signed a five-year, $235.65 million compact with the Government of Armenia. The single stated goal of the "Armenian Compact" is "the reduction of rural poverty through a sustainable increase in the economic performance of the agricultural sector." The compact includes a $67 million to rehabilitate up to 943 kilometers of rural roads, more than a third of Armenia's proposed "Lifeline road network". The Compact also includes a $146 million project to increase the productivity of approximately 250,000 farm households through improved water supply, higher yields, higher-value crops, and a more competitive agricultural sector. In 2010, the volume of US assistance to Armenia remained near 2009 levels; however, longer-term decline continued. The original Millennium Challenge Account commitment for $235 million had been reduced to about $175 million due to Armenia's poor governance record. Thus, the MCC would not complete road construction. Instead, the irrigated agriculture project was headed for completion with apparently no prospects for extension beyond 2011. With curtailment of the MCC funding, the European Union may replace the US as Armenia's chief source of foreign aid for the first time since independence. From 2011 to 2013, the European Union is expected to advance at least €157.3 million ($208 million) in aid to Armenia. Armenian State Revenue Committee (housing both the Armenian Customs Service and the Armenian Tax Service) claimed to be corrupt. Armenia's economy is competitive to a few extent with government-connected individuals enjoying de facto monopolies over the import and distribution of basic commodities and foodstuffs, and under-reporting revenue to avoid paying taxes. Despite pronouncements at the highest levels of government on the importance of free competition, Armenia is next to last in the effectiveness of its anti-monopoly policy according to the 2010 results of the World Economic Forum Global Competitiveness Report. According to Vahram Nercissiantz, former president Serzh Sargsyan's chief economic adviser, "Businessmen holding state positions have turned into oligarchs who have avoided paying sufficient taxes by abusing their state positions, distorted markets with unequal conditions, breached the rules of competition, impeded or prevented small and medium-sized business’ entry into manufacturing and thereby sharply deepened social polarization in the republic. Following the advice of economic advisors who cautioned Armenia's leadership against the consolidation of economic power in the hands of a few, in January 2001, the Government of Armenia established the State Commission for the Protection of Economic Competition. Its members cannot be dismissed by the government. In June 2011, Armenia adopted a Law on Free Economic Zones (FEZ), and developed several key regulations at the end of 2011 to attract foreign investments into FEZs: exemptions from VAT (value added tax), profit tax, customs duties, and property tax. The “Alliance” FEZ was opened in August 2013, and currently has nine businesses taking advantage of its facilities. The focus of “Alliance” FEZ is on high-tech industries which include information and communication technologies, electronics, pharmaceuticals and biotechnology, architecture and engineering, industrial design and alternative energy. In 2014 the government expanded operations in the Alliance FEZ to include industrial production as long as there is no similar production already occurring in Armenia. In 2015, another “Meridian” FEZ, focused on jewelry production, watch-making, and diamond-cutting opened in Yerevan, with six businesses operating in it. The investment programs for these companies must still be approved by government. The Armenian Government approved the program to construct the Meghri free economic zone at the border with Iran, which is expected to open in 2017. According to one analyst, Armenia's economic system is anticompetitive due to the structure of the economy being a type of "monopoly or oligopoly". "The result is the prices with us do not drop even if they do on international market, or they do quite belated and not to the size of the international market." According to the estimate of a former prime minister, Hrant Bagratian, 55 percent of Armenia's GDP is controlled by 44 families. In early 2008, the State Commission for the Protection of Economic Competition named 60 companies having "dominant positions" in Armenia. In October 2009, when visiting Yerevan, the World Bank’s managing director, Ngozi Okonjo-Iweala, warned that Armenia will not reach a higher level of development unless its leadership changes the "oligopolistic" structure of the national economy, bolsters the rule of law and shows "zero tolerance" towards corruption. "I think you can only go so far with this economic model," Ngozi Okonjo-Iweala told a news conference in Yerevan. "Armenia is a lower middle-income country. If it wants to become a high-income or upper middle-income country, it can not do so with this kind of economic structure. That is clear." She also called for a sweeping reform of tax and customs administration, the creation of a "strong and independent judicial system" as well as a tough fight against government corruption. The warning was echoed by the International Monetary Fund. Since 2000, the Russian state has acquired several key assets in the energy sector and Soviet-era industrial plants. Property-for-debt or equity-for-debt swaps (acquiring ownership by simply writing off the Armenian government's debts to Russia) are usually the method of acquiring assets. The failure of market reforms, clan-based economics, and official corruption in Armenia have allowed the success of this process. In August 2002, the Armenian government sold an 80 percent stake in the Armenian Electricity Network (AEN) to Midland Resources, a British offshore-registered firm which is said to have close Russian connections. In September 2002, the Armenian government handed over Armenia's largest cement factory to the Russian ITERA gas exporter in payment for its $10 million debt for past gas deliveries. In January 2003, the Armenian government and United Company RUSAL signed an investment cooperation agreement, under which United Company RUSAL (which already owned a 76% stake) acquired the Armenian government's remaining 26% share of RUSAL ARMENAL aluminum foil mill, giving RUSAL 100% ownership of RUSAL ARMENAL. On November 1, 2006, the Armenian government handed de facto control of the Iran-Armenia gas pipeline to Russian company Gazprom and increased Gazprom's stake in the Russian-Armenian company ArmRosGazprom from 45% to 58% by approving an additional issue of shares worth $119 million. This left the Armenian government with a 32% stake in ArmRosGazprom. The transaction will also help finance ArmRosGazprom's acquisition of the Hrazdan electricity generating plant’s fifth power bloc (Hrazdan-5), the leading unit in the country. In October 2008 the Russian bank Gazprombank, the banking arm of Gazprom, acquired 100 percent of Armenian bank Areximbank after previously buying 80 percent of said bank in November 2007 and 94.15 percent in July of the same year. In December 2017 government passed over gaz distribution network in Meghri and Agarak construction of which was funded by foreign aid and costed about 1.3 billion AMD for cost-free use to Gazprom Armenia. Critics of the Kocharian government say that the Armenian administration never considered alternative ways of settling the Russian debts. According to economist Eduard Aghajanov, Armenia could have repaid them with low-interest loans from other, presumably Western sources, or with some of its hard currency reserves which then totaled about $450 million. Furthermore, Aghajanov points to the Armenian government's failure to eliminate widespread corruption and mismanagement in the energy sector – abuses that cost Armenia at least $50 million in losses each year, according to one estimate. Political observers say that Armenia's economic cooperation with Russia has been one of the least transparent areas of the Armenian government's work. The debt arrangements have been personally negotiated by (then) Defense Minister (and now President) Serge Sarkisian, Kocharian's closest political associate. Other top government officials, including Prime Minister Andranik Markarian, had little say on the issue. Furthermore, all of the controversial agreements have been announced after Sarkisian's frequent trips to Moscow, without prior public discussion. Finally, while Armenia is not the only ex-Soviet state that has incurred multimillion-dollar debts to Russia over the past decade, it is the only state to have so far given up such a large share of its economic infrastructure to Russia. For example, pro-Western Ukraine and Georgia (both of which owe Russia more than Armenia) have managed to reschedule repayment of their debts. Since early 2008, Armenia's entire rail network is managed by the Russian state railway under brand South Caucasus Railways. Russian natural gas reaches Armenia via a pipeline through Georgia. The only operational rail link into Armenia is from Georgia. During Soviet times, Armenia's rail network connected to Russia's via Georgia through Abkhazia along the Black Sea. However, the rail link between Abkhazia and other Georgian regions has been closed for a number of years, forcing Armenia to receive rail cars laden with cargo only through the relatively expensive rail-ferry services operating between Georgian and other Black Sea ports. The Georgian Black Sea ports of Batumi and Poti process more than 90 percent of freight shipped to and from landlocked Armenia. The Georgian railway, which runs through the town of Gori in central Georgia, is the main transport link between Armenia and the aforementioned Georgian seaports. Fuel, wheat and other basic commodities are transported to Armenia by rail. Armenia's main rail and road border-crossing with Georgia (at 41°13′41.97″N 44°50′9.12″E﻿ / ﻿41.2283250°N 44.8358667°E﻿ / 41.2283250; 44.8358667) is along the Debed river near the Armenian town of Bagratashen and the Georgian town of Sadakhlo. The Upper Lars border crossing (at Darial Gorge) between Georgia and Russia across the Caucasus Mountains served as Armenia's sole overland route to the former Soviet Union and Europe. It was controversially shut down by the Russian authorities in June 2006, at the height of a Russian-Georgian spy scandal. Upper Lars is the only land border crossing that does not go through Georgia's Russian-backed breakaway regions of South Ossetia and Abkhazia. The other two roads linking Georgia and Russia run through South Ossetia and Abkhazia, effectively barring them to international traffic. The closing of the border by Turkey has cut Armenia's rail link between Gyumri and Kars to Turkey; the rail link with Iran through the Azeri exclave of Nakhichevan; and a natural gas and oil pipeline line with Azerbaijan. Also non-functioning are roads with Turkey and Azerbaijan. Despite the economic blockade of Turkey on Armenia, every day dozens of Turkish trucks laden with goods enter Armenia through Georgia. In 2010, it was confirmed that Turkey will keep the border closed for the foreseeable future after the Turkey-Armenia normalization process collapsed. A new gas pipeline to Iran has been completed, and a road to Iran through the southern city of Meghri allows trade with that country. An oil pipeline to pump Iranian oil products is also in the planning stages. As of October 2008, the Armenian government was considering implementing an ambitious project to build a railway to Iran. The 400 kilometer railway would pass through Armenia's mountainous southern province of Syunik, which borders Iran. Economic analysts say that the project would cost at least $1 billion (equivalent to about 40 percent of Armenia's 2008 state budget). As of 2010, the project has been continuously delayed, with the rail link estimated to cost as much as $4 billion and stretch 313 km (194 mi). In June 2010, Transport Minister Manuk Vartanian revealed that Yerevan is seeking as much as $1 billion in loans from China to finance the railway's construction. See Armstat publication (in English) "Labour market in the Republic of Armenia, 2017" for more recent data. According to official figures from ArmStat average monthly wage in 2017 stood at 194 thousand AMD (about $404 at Feb 2018 exchange rate). According to World Bank data unemployment ratio in 2016 stood at 16.76%. According to research commissioned by the Yerevan office of the Organization for Security and Co-operation in Europe (OSCE), at least one in three working-age Armenians was unemployed as of February 2005 despite several consecutive years of double-digit economic growth. The finding sharply contrasts with government's official unemployment rate of about 10 percent. A 2003 household survey conducted by the National Statistical Survey found that the real unemployment rate is about 33 percent. Since gaining independence in 1991, hundreds of thousands of Armenia's residents have gone abroad, mainly to Russia, in search of work. Unemployment has been the major cause of this massive labor emigration. OSCE experts estimate that between 116,000 and 147,000 people left Armenia for economic reasons between 2002 and 2004, with two-thirds of them returning home by February 2005. According to estimates by the National Statistical Survey, the rate of labor emigration was twice as higher in 2001 and 2002. According to an OSCE survey, a typical Armenian migrant worker is a married man aged between 41 and 50 years who "began looking for work abroad at the age of 32-33." Armenia is working on addressing its environmental problems. Ministry of Nature Protection has introduced a pollution fee system by which taxes are levied on air and water emissions and solid waste disposal. Armenia's greenhouse gas emissions decreased 62% from 1990 to 2013, averaging -1.3% annually. ^ a b c d e f g h "PRELIMINARY MAIN MACRO-ECONOMIC INDICATORS of Armenian Economy in 2017 by Armstat" (PDF). Retrieved 28 February 2018. ^ "GINI index (World Bank estimate)". data.worldbank.org. Retrieved 17 February 2019. ^ "Ease of Doing Business in Armenia". Doingbusiness.org. Retrieved 2017-11-21. ^ a b "ARKA 2017 GDP". Retrieved 18 January 2017. ^ "Economic Freedom of the World: 2018 Annual Report". Fraser Institute. 2018-09-25. Retrieved 2018-11-06. ^ "Armenia's position in index of economic freedom 2018 worsens". arka.am. Retrieved 2018-10-18. ^ "Armenia is up two notches in Global Competitiveness Index 2018". arka.am. Retrieved 2018-10-18. ^ a b c Curtis 1995, p. 42. ^ Curtis 1995, p. 42–43. ^ Curtis 1995, p. 43. ^ Curtis 1995, p. 41. ^ Curtis 1995, p. 48–50. ^ a b c Curtis 1995, p. 50. ^ Curtis 1995, p. 50–51. 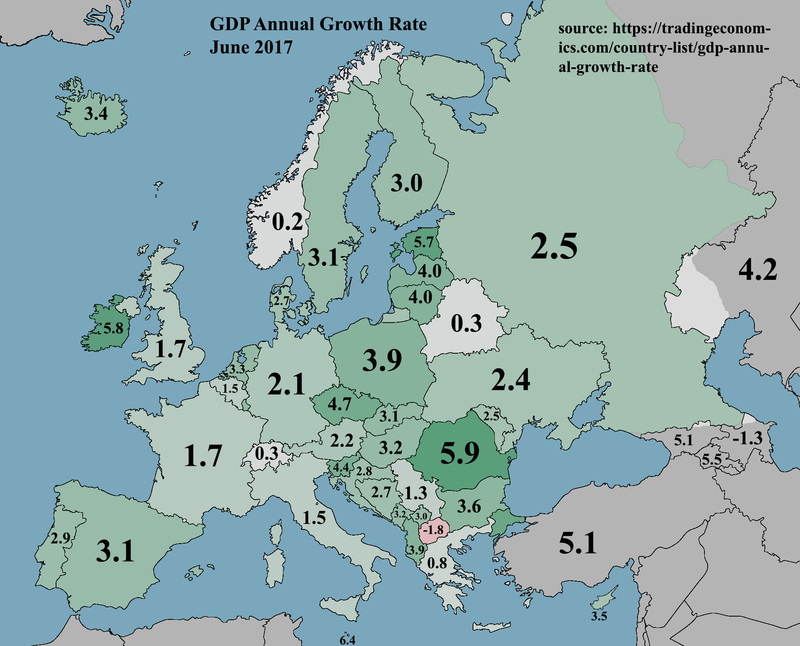 ^ "GDP Annual growth rate, June 2017". tradingeconomics.com. 2017. ^ "Armenia leads EEU countries on level of economic growth – official EEC data". armenpress.am. Retrieved 2018-12-03. ^ "Armenia Finance Ministry: GDP per capita will be $4,600 in 2019". news.am. Retrieved 2018-11-13. ^ "GDP per capita, PPP (current international $) | The World Bank". 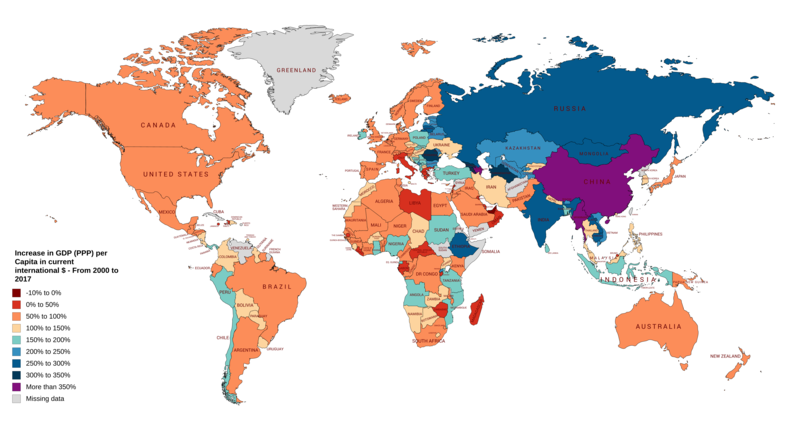 ^ "map of GDP PPP 2000-2017 growth rates worldwide (Data by the World Bank)". ^ a b "Time series, Gross Domestic Product at market prices, mln. drams". Retrieved June 5, 2016. ^ "Time series, Average de jure Population Number, thousand pers". Retrieved June 5, 2016. ^ "Time series, GDP index-deflator (ratio of GDP at current prices to the volume of GDP at comparable prices of the previous year), %". Retrieved June 5, 2016. ^ "Armenian 2017 GDP breakdown by sector - Armstat (am)" (PDF). ^ a b c "Armenian 2017 foreign trade summary - Armstat (ru)" (PDF). ^ a b c "Armenian Growth Still In Double Digits", Armenia Liberty (RFE/RL), September 20, 2007. ^ a b c d e "Armenia Learning From Crisis, Says World Bank ", Armenia Liberty (RFE/RL), November 27, 2009. ^ a b c d e f g h i j k l m n o p q r s t u v w x y z aa ab ac Armenia in 2010. A Year of Uncertainty (PDF). Yerevan: The Civilitas Foundation. 2010. ISBN 978-99941-2-503-6. Archived from the original (PDF) on 2014-04-21. ^ "Armenian economy macro statistics for 2017" (PDF). ^ "Government Downplays Economic Cost Of Russian Gas Price Hike", Armenia Liberty (RFE/RL), February 10, 2006. ^ "Net profit of Armenian banks grow 8 billion AMD in 2017". armenpress.am. Retrieved 2018-05-06. ^ a b "Armenia Industry Research – Banks (07 May 2018)" (PDF). ^ a b c "Armenian Tourism Figures Questioned". RFE/RL. 2010-06-04. Retrieved 2011-02-22. ^ "Kocharian Orders Tax Exemption For Armenian Farmers", Armenia Liberty (RFE/RL), August 8, 2006. ^ a b "Untouched and Out of Touch: Armenia not affected by US crisis due to relative insignificance", ArmeniaNow, October 3, 2008. ^ a b c Change Needed in Distribution of Foreign Credits: Union chair says economic indexes "disturbing", ArmeniaNow.com, November 27, 2009. ^ "Ժամանակագրական շարքեր / Հայաստանի Հանրապետության Ազգային վիճակագրության ծառայություն". www.armstat.am. Retrieved 2018-02-18. ^ a b c "Cash Transfers To Armenia Jump To New High", Armenia Liberty (RFE/RL), August 5, 2008. ^ a b c d e "Survey Highlights Armenia’s Lingering Unemployment", Armenia Liberty (RFE/RL), February 9, 2006. ^ "Moody's changes outlook on Armenia's rating to positive from stable; B1 rating affirmed". arka.am. Retrieved 2018-03-22. ^ "Armenia debt-to-GDP ratio to drop 1% in 2018, minister says". PanARMENIAN.Net. Retrieved 2018-03-22. ^ "Armenia`s external debt is mainly concentrated on loans of international financial organizations | Finport.am". Retrieved 2018-03-22. ^ a b c d "Government Keeps Up Strong Growth In Tax Revenues", Armenia Liberty (RFE/RL), October 14, 2008. ^ "Armenia - CountryPedia - Papaya Global". CountryPedia - Papaya Global. Retrieved 2016-12-28. ^ a b "Armenia: Foreign Trade Deficit $1.94 Billion in 2017 - Hetq.am". Retrieved 2018-02-08. ^ a b "Foreign sector of economy in 2017 - Armstat" (PDF). Armstat (in Russian). ^ a b c "Внешняя торговля: ТОП-10 торговых партнеров Армении в 2017 году - Hetq - Новости, статьи и расследования" (in Russian). Retrieved 2018-02-08. ^ a b "Экспорт Армении по итогам 2017 года составил $2 242.9 млн., рост стал максимальным за 5 лет". arka.am. Retrieved 2018-02-08. ^ a b "Armenia Keeps Up Robust Growth", Armenia Liberty (RFE/RL), March 30, 2007. ^ a b c "Armenia Posts Record-High Trade Deficit", Armenia Liberty (RFE/RL), January 8, 2007. ^ a b c Chinese FM Visits Armenia, Urges Closer Ties, Armenia Liberty (RFE/RL), February 17, 2011. ^ Armenia, Georgia Agree On Joint Border Control, Armenia Liberty (RFE/RL), February 16, 2011. ^ a b "Foreign Investment In Armenia Down In 2017". «Ազատ Եվրոպա/Ազատություն» ռադիոկայան (in Armenian). Retrieved 2018-04-18. ^ a b c d e "Foreign investments in 2017 - armstat.am" (PDF) (in Russian). ^ a b "Net foreign direct investment in Armenia's real sector in 9 months amount to 59.8 billion drams". ARKA News Agency. Retrieved 2018-12-03. ^ "Օտարերկրյա ներդրումները 2018 թվականի հունվար-սեպտեմբերին" (PDF). ^ "FDI data UNITED NATIONS CONFERENCE ON TRADE AND DEVELOPMENT" (PDF). Retrieved 2018-02-28. ^ a b "FDI data by ArmStat" (PDF) (in Amharic). Retrieved 2018-02-18. ^ "Armenia and Millennium Challenge Corporation: Building a Dynamic Partnership for Poverty Reduction through Economic Growth" Archived May 14, 2009, at the Wayback Machine, Millennium Challenge Corporation, March 27, 2006. ^ Press Review, Armenia Liberty (RFE/RL), February 26, 2009. ^ a b c Competitive Edge: The pitfalls of monopolies, and the challenges of a business-influenced parliament, ArmeniaNow.com, January 4, 2008. ^ a b c d "Investment Climate Statements for 2017". www.state.gov. Retrieved 2018-02-17. This article incorporates text from this source, which is in the public domain. ^ Price Predictions: With present inflation at nearly triple expectation, economists challenge 2009 forecast, ArmeniaNow.com, November 14, 2008. ^ a b Armenia Warned To End ‘Oligopoly’, Armenia Liberty (RFE/RL)October 10, 2009. ^ New Russian Gas Price For Armenia Unveiled, Armenia Liberty (RFE/RL), September 23, 2008. ^ Armenian Railway Under Anti-Trust Investigation, Armenia Liberty (RFE/RL), November 5, 2008. ^ Armenian Premier Downplays Impact Of Georgia War, Armenia Liberty (RFE/RL), August 28, 2008. ^ Armenian Cement Plant ‘Sold To Russian Firm’, Armenia Liberty (RFE/RL), August 15, 2008. ^ Press Review (quoting Zhamanak Yerevan), Armenia Liberty, March 19, 2007. ^ Armenia Airport Hamstrung By Mysterious Fuel Shortage, Armenia Liberty (RFE/RL), November 7, 2005. ^ Armenian Central Bank Approves Another Rate Rise, Armenia Liberty (RFE/RL), June 3, 2008. ^ Government Vows To Curb Rising Inflation, Armenia Liberty (RFE/RL), May 29, 2008. ^ Mining Giant Remains Armenia’s Top Taxpayer, Armenia Liberty (RFE/RL), January 29, 2008. ^ Armenia Hit By Sugar Shortage, Armenia Liberty (RFE/RL), October 23, 2007. ^ Editors Concerned About Sale Of Newspaper Distribution Firm, Armenia Liberty (RFE/RL), September 13, 2007. ^ French Mobile Giant Set To Win Armenia Tender, Armenia Liberty (RFE/RL), October 6, 2008. ^ Armenian Telecom Operator Fined $1 Mln, Armenia Liberty (RFE/RL), July 30, 2008. ^ Armenian Telecom Sector Further Liberalized, Armenia Liberty (RFE/RL), August 24, 2007. ^ a b c d Socor, Vladimir. "Armenia's Energy Sector, Other Industrial Assets Passing Under Russia's Control", IASPS Policy Briefings: Oil in Geostrategic Perspective, November 13, 2002. ^ "Сеть газоснабжения в Мегри и Агараке безвозмездно передана ЗАО "Газпром-Армения": предложение о продаже отклонено - Hetq - Новости, статьи и расследования" (in Russian). Retrieved 2017-12-19. ^ a b c d "Armenia ‘Pressing Ahead’ With Iran Rail Link", Armenia Liberty (RFE/RL, October 14, 2008. ^ a b "Armenia Scrambles To Restore Vital Supplies Via Georgia", Armenia Liberty (RFE/RL), August 18, 2008. ^ a b c "Russia, Georgia Agree To Reopen Border Gate", Armenia Liberty (RFE/RL), December 24, 2009. ^ "Labour market in the Republic of Armenia, 2017 / Armenian Statistical Service of Republic of Armenia". www.armstat.am. Retrieved 2018-03-01. ^ "World Development Indicators (Google Public Data Explorer)". www.google.com. Retrieved 2018-02-18. ^ "Greenhouse Gas Emissions in Armenia (by USAID)" (PDF). Curtis, Glenn Eldon, ed. (1995). Armenia, Azerbaijan, and Georgia: country studies. Washington, D. C.: Federal Research Division, Library of Congress. ISBN 0844408484. Wikimedia Commons has media related to Economy of Armenia. Energy in Armenia describes energy and electricity production, import and consumption in Armenia.